A magazine is a living thing, and this has always excited us about Jarry—that it evolves and grows with each new issue. You may have noticed in Issue 4 that we adopted a new identity, “A Queer Food Journal.” When we first launched in 2015 with “Men + Food + Men,” we’d thought it best to focus on the G part of LGBTQ, since that’s the group we, the founders (gay men), could speak to. But as we’ve grown, we’ve reassessed what it means to be “jarrytype.” We spent some time exploring the types of stories that we find interesting and important, and we imagined how the Jarry community might like us to grow, and if in today’s increasingly divided world, there’s anything gained by separating the Gs from the LBTQs. We decided to expand our scope. What we like about the word “queer,” in its reclaimed sense, is its generosity. It not only seeks to encompass the full LGBTQ+ community, but it’s also a word that can be gracefully applied to a physical space—such as, say, the kitchen, or a living, breathing one like a community. We want Jarry to be a welcoming queer space, one you can enter via the printed pages or online and find queer people and queer ideas intersecting via a shared passion for cooking and food culture. 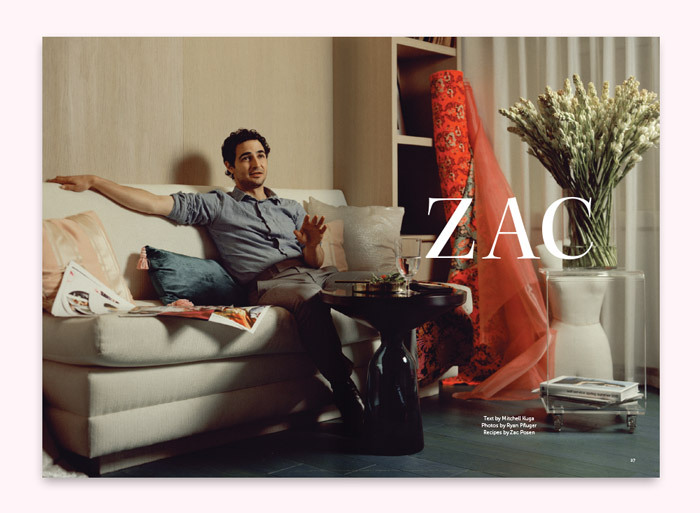 In Issue 5’s theme we explore the full meaning of another word, “style,” and ultimately find through the subjects featured that true style is never without “substance.” In addition to helming a global fashion brand and sitting as a judge on Project Runway, Issue 5’s style leader Zac Posen is a skilled, zealous, and opinionated cook. He recently published the terrific cookbook Cooking with Zac (a few of his recipes follow Mitchell Kuga’s profile in Issue 5). We also join veteran food stylist Roscoe Betsill on a tour of the past 70 years of food styling—which is about as long as the industry has been around. And David Tanis treats us to a family-style feast, sharing the story of his life and career as an acclaimed writer and chef. In “Portraits of Taste,” photographer Rob Truglia examines, through his lens, the personal styles of six notable young queer people in New York’s food scene right now: Andre Springer, Angela Dimayuga, DeVonn Francis, Shannon Mustipher, Casey Elsass, and Sara Elise. And then in “Honoring the Classics,” we take a few classic cocktails, tweak them with seasonal influences, and better understand what it is that makes a classic endure. As the issue continued to take shape, it became clear that the true meaning of “style” goes far beyond the visual. That style can describe the very substance of a person or an idea, and that these traits are often heard and felt more than seen. In “Refashioning Resistance,” cookbook author Julia Turshen and her wife, Design*Sponge founder Grace Bonney, discuss how in their work in “lifestyle media” they’ve had to rewrite some of the rules they perceive to exist in their industries—first and foremost, that food or design platforms should not be used to address politics and current events. Similarly, Mayukh Sen profiles the refreshingly provocative British baker, writer, and Great British Bake Off alum Ruby Tandoh, who has challenged the same conventions. As as a queer woman of color, she advocates (compellingly and lyrically in her writing) for more meaningful and responsible conversations about food—ones that factor in things like race, gender, history, and economics. And in “Queer Supper Clubs Save the Day,” we feature five different supper clubs from across the country that are also seeking to gather LGBTQ+ people around a love of food and community. We were energized to learn how many of them have come into existence over the past few years, and yet how thrillingly unique each one is. In crafting Issue 5: Style & Substance, we found a common thread that runs throughout: that many were motivated not just by food, but by activism and the desire to build community. And in this, we hope you, too, find real style inspiration.